G4K Find Squirrel is another point & click escape game developed by Games4King. There was a fort on a huge dark area. There was a squirrel living there. The squirrel went inside the fort to take fruit. The squirrel went into the castle and snatched all the fruit. The squirrel was caught in a room where the fruits were snatched out. Your duty is to find the squirrel. 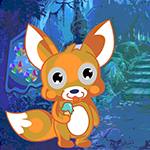 Find hidden clues and solve puzzles to rescue the animal. Good luck and have fun!